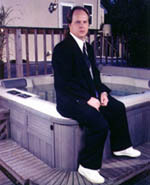 Since we were originally interviewed for StrikingItRich.com, Long Island Hot Tubs has had quite a year! We have moved to a bigger and better location and have greatly increased our warehouse/ shipping space. Our on-line orders have increased approximately 30% over the same time period last year. We are very happy about that. Over the winter of 1998, we added a lot of new items to our website, which now boasts over 500 pages of pool and spa information and products. We have added "shopping cart" technology to our site, which makes product ordering much easier for our customers. We still do not have all of our products in the "cart" program, but we are working on it. We definitely have learned that "the more you show, the more you sell". International sales have still not taken off as we had expected. We do get a few orders a week from areas out of the USA, but the response has been much less than we anticipated. We feel that the high cost of international shipping, taxes and duties still make it fairly cost prohibitive for the international purchaser. However, last week we sold a hot tub heater to a customer in Germany. The heater cost under $200.00US and the shipping alone was over $170.00US. Not too cost effective for the happy hot tubber! In StrikingItRich.com, Jaclyn pointed out that we had not been making full use of our list of email addresses of our customers. She was shocked that we had not been following up with emails to our customers. Her observation made us give it a try. Thank's Jaclyn !!! We now know that a little sale, presented properly in an email notification - can do wonders. We can typically pull in thousands of dollars (of profit!) per emailing. We have learned that you can overdo it, though. Every other month we try to offer a special sale to our Internet customers. That timing seems to work well. Over the past year we have had a lot of media exposure and have won a few major industry awards. The National Spa and Pool Institute, our industry's "governing body" and trade association, voted our Virtual Pool and Spa Store as the "Best Retail Pool & Spa Website" in the USA. Their Consumer Influence Award is presented only once per year and is quite an honor to receive. We were voted one of the top 100 pool and spa companies in the country by Aqua Magazine, winning their Aqua 100 award for the third time. Very few pool & spa businesses ever win this award, much less for three years ! Our website was featured nationally on the Sci-Fi Channel, CNBC, C|Net's show "The Web" and WNBC's TV.COM. It was a lot of fun to have the TV crews around our office taping the shows. The segments were about making money on the Web, and the shows profiled Long Island Hot Tubs' success as an example. We are beginning the process of looking for financing to greatly expand our operations. We want to become the Amazon.com of pool and hot tub supplies. Over this coming winter we will be reviewing many of the offers we have had, and developing a firm business plan for the future direction and expansion of our Virtual Pool and Spa Store.